If you have been searching for the perfect homemade Italian sausage recipe, there are literally hundreds, if not thousands of recipes in cookbooks, online, and in magazines. Essentially, there is no perfect recipe because the taste is always a subjective sensation. However, you can experiment with a few different recipes and then choose the one that is right for your palette. Making your own Italian sausage gives you the opportunity to add more or less spices and herbs, such as fennel and garlic. The best part of making your own is that you don't always have to be at the mercy of the often bland sausages that you find at your local grocery store. Once you have made a homemade Italian sausage recipe you can freeze eight to sixteen ounce portions and then take it out whenever you feel like making a dish. It will last for at least a year in the freezer if properly wrapped. Making your own Italian sausage requires a little bit of time, so set aside at least an afternoon to make it. You will need a meat grinder. Combine all of the ingredients into one large bowl and toss to coat the pieces of meat. Refrigerate at least overnight, and up to 24 hours to allow the flavors to blend together. Working with the meat as cold as possible, pass the mixture through a meat grinder fitted with a medium-sized die. If you don't have a meat grinder, you can use a food processor and pulse until the meat is finely ground. At this point you can wrap portions of the meat up in plastic wrap and butcher paper and put it in the freezer. Or, you can choose to pipe it into sausage casings for a more traditional-style sausage mold. Cut the meat off the bone and grind through a meat grinder with a medium die attached. Make certain that the meat remains cold after it comes out of the grinder. This is best achieved by adding it to a bowl in the refrigerator. Add all of your spices to the bowl and then mix with your hands until the flavorings are well incorporated into the meat. At this point you can test your sausage by frying a little of it in a pan. Adjust the salt or pepper or heat accordingly. Stuff red bell peppers with a mixture of cooked Italian sausage and cooked rice. Bake them in a 350 degree oven until soft and serve with a classic tomato sauce. 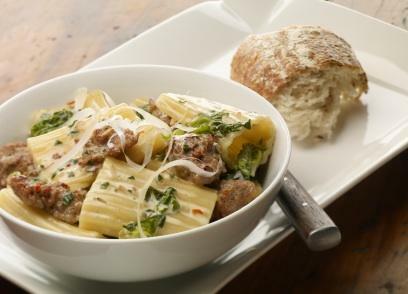 Add Italian sausage to a bottle of your favorite pasta sauce to give it a homemade kick. Fry up about a pound of sausage, add sliced vegetables, such as peppers, onion and winter kale, then pour over cooked pasta for a quick mid-week meal. A little Italian sausage is excellent in a Sunday-morning omelette. Pair with parmesan cheese and some jarred roasted red peppers. Give your baked ziti a little kick with spicy homemade sausage. Layer it in a homemade lasagna. Sprinkle it on a pizza with cheese, tomato sauce and mushrooms.